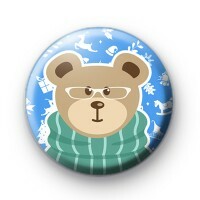 Cute Christmas bear badge in blue featuring a lovely illustration of a festive winter bear wearing spectacles and a huge green scarf. The badge also has white illustrations in the background of reindeer, Santa hats, Christmas presents, Holly & rocking horses. This is a really cute Christmas badge and is perfect to hand out to younger children during the Christmas holidays. We have hundreds of Christmas badges to choose from and all of our badges are made in Great Britain. Standard 25mm Xmas badge.